Home > RC Hobby > Motor Battery Packs > 8EP4200SC: 9.6 volt 4200 NiMH rechargeable Battery Pack with TAMIYA connector - for RC hobby, Airsoft, etc. 8EP4200SC: 9.6 volt 4200mAh NiMH rechargeable Battery Pack with TAMIYA connector - for RC hobby, Airsoft, etc. High-output, high-capacity, high-amp capability. These can be slow charged or fast-charged. 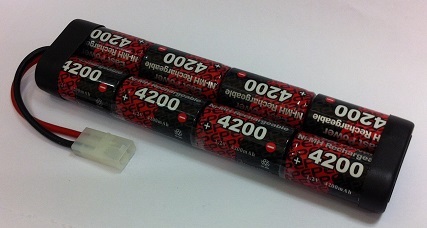 Battery pack length = approximately 6 1/2". Other connectors available - see menus. These battery packs are MADE IN THE USA by BATTERIES AMERICA. Pricing effective April 2019.